Today, November 6, 2012, is the general election in the United States, and many Americans will be going to cast votes for the next President of the United States, if they haven't already. The Everybody Votes Channel was released on February 13, 2007 for the Nintendo Wii and was (and is) available as a free Wii Channel download from the Wii's Shop Channel. If you own a Nintendo Wii, you have the opportunity to participate in weekly votes through the Everybody Votes Channel. The questions are usually simple, such as one this week being something like, "Do you feel small when looking at stars? ", and they have been consistently updated. 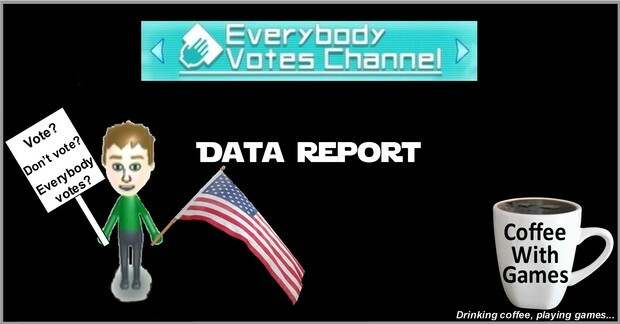 How many hours have U.S. Wii owners reported voting through the Everybody Votes Channel with over 5 years of data possibly reported? Brew yourself some coffee on this general election day, and let's take a look! 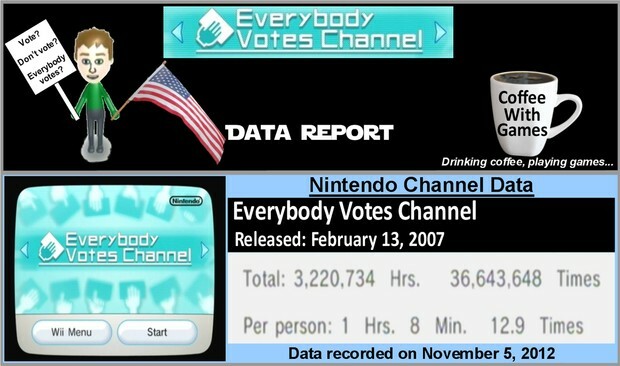 The Everybody Votes Channel has approximately 2,840,592 Wii owners from the United States that have reported data, with 2,092 days possibly reported. The average "voting" time reported is 1 Hour 8 Minutes "Per person" as the image shows, which averages to be just over 5 minutes spent per time/day reported on the Everybody Votes Channel. I enjoy politics, and it's probably a lot to do with how I was raised. Whether it was running around as a young bean with my dad dealing with political yard signs, or running for Student Council in junior high and high school with my mom basically as my campaign manager, I have enjoyed political activities for a long time now. I enjoy a good political debate. Not the debates on TV though, usually because I often find the questions and topics to be completely stupid; but I do enjoy throwing ideas around, and seeing which ones make sense and which ideas don't make sense. I also don't mind defending political positions that I have held, or candidates I have supported, in a civil manner. I do believe that if you are voting for somebody though, let's say a presidential candidate, you should at the very least be able explain why you are voting for them, and it shouldn't be "They are Democrat", or "They are Republican". It also shouldn't be "Because the other candidate is terrible." I think there needs to be a reason to vote FOR a candidate, and not simply AGAINST another candidate. You might be wondering, "Coffee, are you voting this year?" As for voting this year, sadly I don't see a reason to vote FOR either of the main two presidential candidates touted to everybody voting by the media: President Obama or Mitt Romney. I see few, if any, differences between them on issues that matter to me the most (can neither of them produce a balanced budget their first (or second) term, seriously? ), and I don't feel like going out wasting my time on either of them this election. As for the Everybody Votes Channel data, I think it's interesting nearly 3 million United States Wii owners have used the channel to "vote", or at least checked out the channel, since it released. I wonder how many of those Wii owners will be voting today in the general election, or have already voted? It's a pretty high number that have reported data though, and is higher than Wii games like Mario Kart Wii and Super Smash Bros. Brawl. The overall average "Per person" is slightly lower than I expected though, based on our reported time; but I think it shows Wii owners just hopped into the channel, voted, then hopped right back out. My wife and I did use the Everybody Votes Channel pretty consistently after Nintendo released it, and we had a good number of votes racked up, but then we just stopped using it on a regular basis as there didn't seem to be really point to voting. Our oldest child has found the Everybody Votes Channel in recent weeks, and changed out all of our Miis and even the language setting on it recently. I'm not sure what happened to our older Miis vote totals, but I hope they are around somewhere! I am wondering if there will be Wii U Channels, and possibly completely new ones that make use of the GamePad in different ways. Perhaps a Wii U Art Channel? I hope Nintendo answers this in the next few weeks (in less than 11 days to be exact! ), along with other Wii U details that aren't yet clear. Have any of you used the Everybody Votes Channel, perhaps every single week since it released, or did you use it early on and stop like we did? Feel free to share your thoughts below, keep them civil (no name-calling! ), and if you want to try and convince me to go and vote today you can do so.